Over the last years, our efforts have been more and more focused on statistical, data and fact based modeling. During these efforts, we have witnessed truly remarkable events in the world of Central Banking and finance. We have also found troubling market evidence and data that have made it clear, that all may not be what it seems - for a long time. A very long time. We will add some reference links to this article if anyone is interested or finds it necessary to understand further elements that will only topically discuss today. However, we will assume your familiarity and basic understanding of the methods of Central Banking and Monetary Policy. Understanding it is both simple and complex - and specifically designed to be that way. The creation of money is implemented via the creation of new credit for almost all of the quantity of money in existence. The remaining very small amount of money is created by printing or manufacture of physical cash. The dollars in your pocket for instance. With the creation of all this money, one would think that the Central Banks and the Treasury would be the major manufacturers. However, the reality is that most new money is created directly by Banks under the supposed auspices of the Central Banking system. Whichever way one looks at the above scheme, it is clear that any scheme would be fraught with risk in which private individuals were not only enabled but encouraged, banking license in hand, to lend money into existence as fast and in as great of quantities as possible. Further rewarding said individuals with benefits such as shares and large bonuses for executing a primarily non-accretive activity, is conflicted and dangerous. The reason for touching on this subject is that the FED, which operates as the Central Bank of the World, and its subordinate Central Banks and Institutions, primarily IMF, WBG, BIS, BOJ, BOE, ECB and SNB, have a keen awareness that charging interest on a quantity of money that is constantly growing and never available in great enough quantity to repay the interest on the credit that created it, is not plausible - even with accounting and reporting slight-of-hand. Therefore, these institutions have been constantly looking for new debt servitude candidates and for new ways to create money and amplify money without amplifying debt obligations. Better said, ways to increase the quantity money at a faster rate than the quantity of debt. These expansionist policies went into overdrive in the late 90's heading into Y2K. I distinctly recall the outright panic that the FED tried to convey at every possible opportunity regarding the two digits 99, as in 1999, flipping to 00, as in 2000. It was overt, misleading and disturbing. Mr. Greenspan was in fact openly discussing the risk of Y2K not only on the financial system but the nuclear defense system and global war machine with obvious implications for a WWIII type scenario. Since when does that not qualify as fear mongering as an agenda? Wall Street Banks were granted huge tax breaks and special arrangements to prepare for the coming of God - Y2K. There were quite a lot of religious extremists at the time whose belief was that Y2K would herald the end of the world and the coming of God. They got no breaks or accommodations for their equally zealous expressions of belief. Sadly, they were far less dangerous than Mr. Greenspan who had similar compunction - masked in Fedspeak...not to mention his disciple "Blogger Ben" lurking in the wings. While working as a consultant/developer at several of the largest US banks in derivatives, structured products, and fixed income at the time, anything and everything that could be dumped into the Y2K budget was. There were several large advantages to this. One being that large firms could reduce their reported expenses and show tremendous productivity gains at the very same time as expanding their technology R&D expenditures and investments simply by putting any expense they could find into a different box for reporting and amortization. This had huge tax implications since special considerations and incentives were also made to support Y2K via various accommodations including tax. Earnings, productivity, and profits all the way into 2000, could, therefore, be goosed by a slush fund that essentially disappeared real expenses out of existence and magically into profits. Wall Street, with all this free cash, FED encouragement and ever declining interest rates was looking for any way to seed its imaginary and cheap money in ever aggressive manners to the world - fueling the dot.com bubble and supported by the constant delusionary recursive productivity claims from Mr. Greenspan. I believe this was the other era when the words "virtuous cycle" were used by major central banks. The end of this scheme climaxed with offers of mortgages on stock holdings regardless of whether investments be in Yahoo or Pets.com or IBM. These products required no liquidations to raise cash for down payment, no sales of securities ever to pay the mortgage off. Your mortgage could be paid off by asset appreciation of one's investment account. No Tax obligations due to asset sales. Most importantly, how much more one could spend on a home now that they can get this fantastic mortgage and keep your stock portfolio while ending up getting the house for free. A total dream! Thank goodness these mortgages did not become as popular as the subprime variety. Nonetheless, the Fed presided over these products and approved their origination. The FED, to great effect, encouraged most of the irresponsible gambling. The ultimate goal? Asset price appreciation and capitalization (money amplification) that increases at a greater quantity than debt expansion. Money amplification was on fill tilt via many new and exotic products and derivatives. These products, as with the Y2K policy regarding the financial system were designed under the specific encouraging oversight of the FED. In many cases, at the behest of the FED. This is no small matter as the FED was already scared at the time that it was running out of ways to expand credit and money fast enough. Additionally, they were even more concerned about the creation of enough quantity of cash to service credit obligations. This is what one sees currently on full tilt in China. A crashing real estate market where debts are unserviceable and central planning looks for any way to put sufficient cash in the hands of debtors to theoretically honor their obligations. After attempting to UN-JAPAN itself from Y2K, the FED reversed its aggressive credit expansionary agenda of the late 90's, once, without calamity, nuclear war or financial meltdown, Y2K had come and gone and they had little cover for such extensive accommodation. The results were obvious to effect. Credit fueled speculation and investing by internet technology firms, sovereigns, and large multinational firms met a tighter and tighter market and was unable to rollover obligations. How many times do we have to play this illogical game? Pressure on the markets was substantial, and a bear market ensued into October 2002. Under the cover of September 11 terrorist attacks, Mr. Greenspan, now had a popular and patriotic excuse for financial modernization unlike we have ever seen in history and began an aggressive search for stratospheric credit expansion via an unending cycle of low rates and regulatory underreach, policy drift and leverage accommodation. This obviously created a new speculation not only in the real-estate markets but much more substantially in the OTC derivatives and debt markets. What would have been obvious to any sensible and practical thinker would be that result of overleveraging will always end the same. Only Central Bankers appear to think that constant asset price appreciation, 2% inflation targets, debt expansion and currency debasement are components of practical policy. The practicality of this kind of planning and care of our society, especially the most junior and senior members of it, is certainly highly questionable and irresponsible. It would be obvious to nearly any sentient human that a deleveraging of epic proportions must be in order when firms who were levered 40 to 1 were still not making enough money and so decided that levering 80 to 1, and in many cases much more, was reasonable and appropriate. No need to discuss the chaotic deleveraging of 2007 to 2009...save with respect to the fact that the obvious answer via planning and policy has been to solve that problem with the same solution 100X. So, take conditions that could not be pushed to further extreme in 2006 and 2007 without central bank directly buying the CDO's, CMO's, CDS's and debt notes of the era to MUCH more significant extreme by doing the only thing they did not do in 2006 and 2007....become the market. Obviously, the FED, during the 2008 to 2009 period got quite used to holding highly risky securities on its books. With the creation of "mark to whatever and whenever you want accounting" it believes it is not obligated to ever show a loss. So, the risks of holding securities, no matter how insolvent or valueless is perceived by the FED as "low". This is so as long as they can maintain confidence in the currency. Recall that the FED bought all the assets from Bear Sterns that JPM did not want. These included several Hotel chains that subsequently ended up insolvent to the tune of something like $20 billion of FED held assets in addition to many other horrid debts that when examined on Maiden Lane Holding's books - miraculously show persistent profits. We are now in the thick of the reason for this article. Imaginary Numbers. Currently, the FED sits at 1% reserves. This would be the same thing as a normal investor owning $1,000,000 with collateral of only $10,000. The bank has publically stated that it would be of little consequence to them if they were to move to -1% or -2% equity because "...they hold till maturity". To put this in perspective, as a trader with an account at Interactive Brokers, if your account were $250,000, what the FED is saying, is that as long as you wish to "hold to maturity", your account can go to -$500,000 without any consequence. Any thinking by those who are responsible for the sanctity of our currency and debt system that shows egregious speculation and fudging of numbers of any type should be a call to alarm. Sadly, if the inanity of aforementioned FED comments were all that was to worry about with regard to imaginary numbers and deceptive policies - this would be bad enough, but possibly manageable. However, the reason for the BACKGROUND section of this article is to present that the FED and other central banks have been attempting for long periods of time to create and implement new methods of printing money that do not involve direct transmission of new interest payment obligations. These policies and interventionist approaches become increasingly risky as their reserve ratio decreases. Especially beyond negative 2%. FED tactics should inspire nothing but doubt at this point as their risk levels are much greater than they are publically admitting. Via our analysis and data, it has become clear via our indexes and statistical analyses like the GAP index, that especially after the 1987 crash an extremely large entity began an agenda of directly seeding money into large risk and debt markets at low liquidity time periods and without regard for loss. To give this some color, let's take a look at the current margin debt markets. Currently, margin debt sits at a record of over $450 billion. How much asset appreciation and market capitalization does $450 billion margin debt buy you? Well, let's look at some more of our data. Last year roughly $650 billion of incoming cash was used to purchase all US stocks. 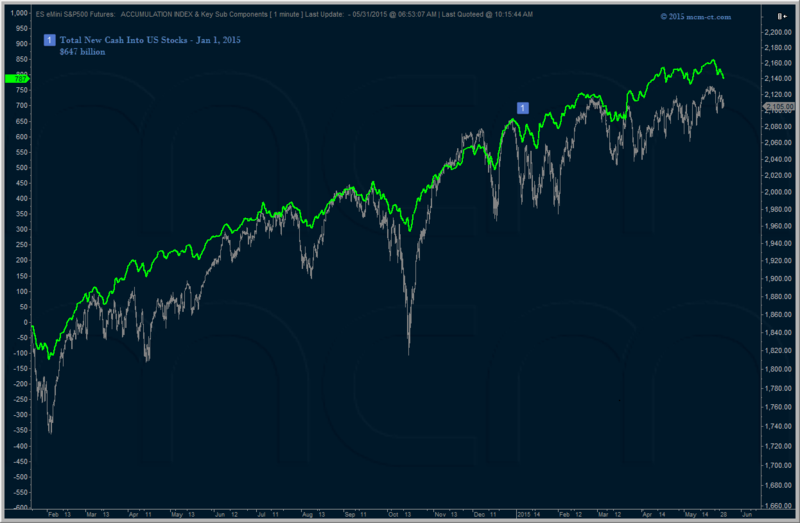 Analysis of only the S&P500, this resulted in the creation of $2.4 Trillion of new theoretically spendable money with say only roughly $50 billion of increase of margin debt. Our calculations are for cash into ALL US stocks, therefore, the amount of total asset appreciation, when applied to all US stocks rather than specifically the S&P500 is estimated to be more like in the $4 trillion area rather than $2.4 trillion. That is quite a substantial amount of money amplification. To the FED way of thinking this is a veritable panacea. Imagine what printing $85 billion a month can do if only $650 billion creates $2.4 trillion in new equity in only the S&P500. Just put into perspective how much new money/equity that $450 billion of margin can create. Money amplification at its finest. So, as we can see, it could be quite effective policy for the FED to play fast and loose with policies, numbers, and reports. The sad fact is that this has most likely been the case for a long time and as such we have not had truly free markets for a much longer time than the last few years. Our market structure algorithms have located this constant drip of capital into assets. Markets that the central banks have no authority over. However, their activity has been like a metronome ensuring that prices travel on a long-term inexorable rise and that they go mostly unnoticed. Via, which accounts these holdings are transacted, would be of significant interest. Having worked on the Fixed Income Desk at one of the largest primary dealers and analyzing, valuing transactions on lots of accounts including unmarked, secret FED accounts inspires little confidence in FED benevolence but rather does so for its unending self-serving appetite and lack of transparency. Seasonal Adjustments revolve around ever changing accommodations for tendencies of economic contributors to vary due to cyclical oscillation. However, there is simply very few quantifiable cyclical basis' that seem to be consistently applied by the FED or reporting bureaus. Rather, seasonal adjustments seem to reflect the discretion of some bureaucrat or entity seeking to goal seek values. Hedonic Adjustments are quality adjustments that attempt to adjust for inequality of product over time. These calculations are utterly useless and 100% discretionary arbitrary. At best Hedonic Adjusted data should be viewed as a secondary reporting index, not a primary index. We will examine this a bit more detail below as they are used to great effect. Imputations are non-economic contributors that are deemed to reflect economic transactional contribution. These too are convenient, arbitrary and highly discretionary and are used to great effect. They are statistically deceptive and mostly entirely irrelevant. What does this have to do with the FED? And to do with Imaginary Numbers? MUST be allowed to supervise and administer (goal seek) most official government economic reporting. MUST exercise more and more interventions and press conferences to expand manipulative tentacles in various markets with direct capital support. MUST attempt to combine data in such a way as to represent a cohesive argument that seems somewhat believable. On the practical side, it is impossible for the many economic reports that are published to be managed in a cohesive manner without tacit control and supervision. It is simply impossible for the FED to accept methodologies that would not meet its standards or agenda. Therefore, from this perspective, the FED is the only logical supervisor. The two most important numbers the FED needs to convince the world and public are real and plausible are GDP and Inflation. Both areas are reported with such lack of discipline and goal seeking that the published numbers are utterly useless. Take the GDP calculations and reporting reflected below. This chart shows what is a nearly perfect parabola. There is simply no way to create such a perfect series of numbers in nature out of something so complex as the millions of US economic elements, businesses, and people. This is GOAL SEEK and CURVE FITTING at it highest extreme. There is simply a less than 15% believability in these numbers based on the basic understanding on how statistics works. On a simple level? Does your bank account look like this? Even if one is a member of the .001% it is highly unlikely that one's accounts look like this or even 30% like this. Normal series will show MUCH more volatility and noise even if the end points end up being the same - just like Warren Buffet's bank account surely does. If these numbers were correct in any fashion, US corporations and citizens would be feeling rather different at this time. 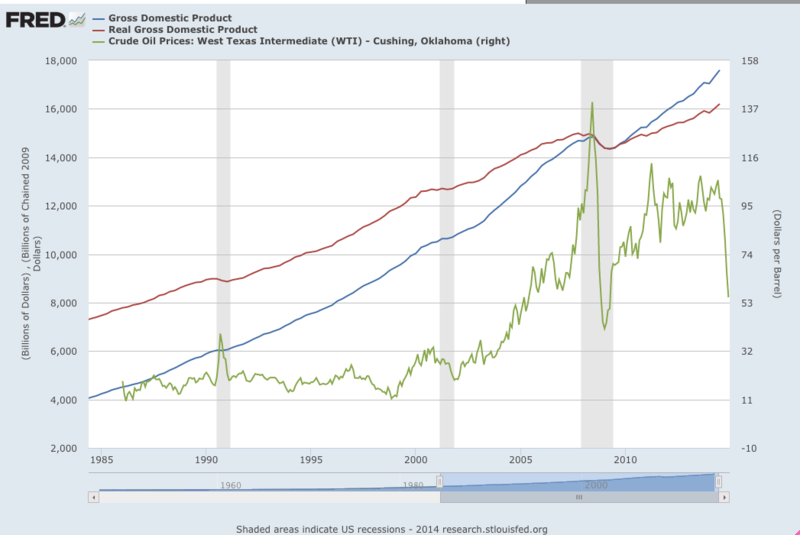 Just compare, the price of Oil to reported GDP...there is simply no explanation for this disconnect from official sources. Just shut up and believe the numbers, please. The term “hedonics” is derived from ancient Greek and basically means “pleasure doctrine”. Certainly apt and intriguing. An iPhone last year cost $700 and an iPhone this year cost $700. However, in the current GDP reporting, these numbers are calculated to incorporate qualitative and subjective;y adjusted contributions to GDP. So, theoretically, if the screen, camera and memory of the iPhone improved. These improvements are estimated for dollar value and contribute to GDP in excess of the $700 transaction for the iPhone. So, i can randomly put a $500 value on the improvements to these elements. BAMM - now iPhones of the same type all contribute $1,200 to GDP. If the addition of new tools and features such as the fingerprint sensor occur, then those are quantified and added to GDP. BAMM BAMM - now a $700 iPhone transaction is worth $1,500 to GDP. The funny thing about goal seeking is how insidious it is. In the above process for the iPhone contribution to GDP, the adjustments that increased GDP are used to discount CPI. This artificially suppresses what is more like an annual 11% inflation rate into something like a 2 or 3% percent inflation rate. Theoretically, an iPhone sells for $700 this year and the equivalent model sold for $700 last year. Hedonics allows the adjustment of the iPhone inflation rate by the additional features and improvements purchasers are not paying for. So $700 - $300 for a better screen, camera, and memory. BAMM now the inflation rate on iPhone is -40%. throw in new features and its down to a number in the CPI of 60% lower than the previous year if we so desire. This contradiction has obvious benefits. It misrepresents true inflation for the whole economy and average person and GDP. This makes the GDP number look better and more efficient. Additionally, it gooses GDP on top of that with the actual hedonically contributed cash values added to real transactions. As a statistical analyst, I must say this is incompetent data collection and analysis at best. Imputations are totally imaginary. If you have paid off your house or receive free offers in the mail, coupons from the grocery store, free bank fees or back to the iPhone, certain intellectual property was developed during the year for the iPhone (say some software innovation or R&D project) that does not result in a direct transaction, these elements can all be arbitrarily be estimated and then contributed to GDP. In the case that you own your home outright, imputed GDP contributions are the result of calculating the value of your home and what you would be paying in rent and then recording those imaginary rent payments as positive contributions to GDP. Needless to say, the obvious nefarious capability of these elements is huge. Since 2009 wouldn't you know it that the primary growth of GDP has occurred not in the advertised headline numbers but similar to the character of just about everything out of official sources these days, in the arbitrary values. This is not unlike the artificial liquidity available to corporations to buy stock, increasing the "E" in EPS but not increasing the "S" in gross or net sales. A mirage that it seems is only too happy to be propagated. SO, in 2009 there were roughly the same amount of Americans working as there are now, only the population has increased by 30 million since then. 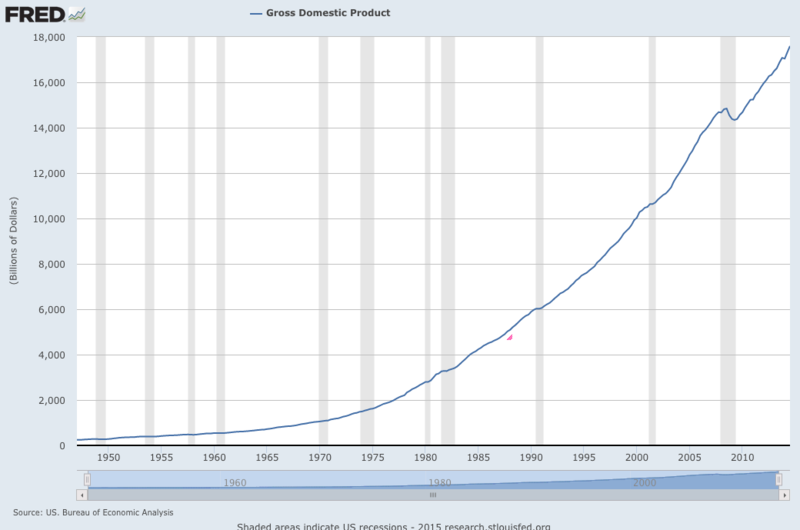 In 2009, GDP was reported at roughly $14.5 trillion. Currently, the reporting proposes a number of $17.5 trillion. HOWEVER, in 2009 GDP minus imputations and hedonics was $9.5 Trillion. Today when you subtract out hedonics and imputations you get $10.5 trillion. Is that not curious? In 6 years the US GDP grew by a real $1 trillion NOT $3 trillion. This would imply a growth rate of imputed contributions of 17.5% a year in an economy unable to deliver much more than a reliable 1.75% growth during that time. As for Hedonic contributions, they are hitting at a growth rate of 20% annually. However you cut it, this is in our opinion engineered, goal-seeked data that is meaningless with regard to the true economy, but very good for the US Debt to GDP ratio...and, therefore, credit worthiness. It is also, convenient for FED policy. The only rational explanation for the constant error and risk distribution always being pushed into the column that benefits the FED agenda is the FED. At best, this pattern can be attributed to incompetence...which on its face is even scarier than the alternative that is knowingly misrepresented and manipulated data as a part of an agenda. The FED promotes confidence as does its recently created outpost the ECB and the previous central bank that the FED is 100% responsible for creating and supervising - the BOJ. However, these institutions can promote their agenda so long as their reserve ratios are close to positive. When they start dropping below 3%, then the likelihood of loss of confidence becomes VERY VERY high, and this is NOT a situation the central banks can control. People will want to see the central banks fund reserves - the options at this time will be limited to them and most likely met with hyperbole: "Trust us we know what we are doing, we expect a strong resumption of strength next year" type commentary. The other reasons that we are posting this article now is that things can happen in an unscripted order and given our article from May 24th: Drama in the Market Seas – a revealing look via the MCM Market Indexes, the primary activity driving market prices may be quickly put under severe distress. Moreover, given the horrific and obvious manipulation of CPI, PPI and GDP - are these signs of an ethically compromised, panicked and fractured institution showing up just when we may need the opposite? Below is a link to a whole Money for Nothing documentary. However, if the link is pulled down - the movie is HIGHLY recommended worth buying from the director or other online source. 97% owned present serious research and verifiable evidence on our economic and financial system. This is the first documentary to tackle this issue from a UK-perspective and explains the inner workings of Central Banks and the Money creation process. When money drives almost all activity on the planet, it's essential that we understand it. Yet simple questions often get overlooked, questions like; where does money come from? Who creates it? Who decides how it gets used? And what does this mean for the millions of ordinary people who suffer when the monetary, and financial system, breaks down? A film by Michael Oswald, Produced by Mike Horwath, featuring Ben Dyson of Positive Money, Josh Ryan-Collins of The New Economics Foundation, Ann Pettifor, the "HBOS Whistleblower" Paul Moore, Simon Dixon of Bank to the Future and Nick Dearden from the Jubliee Debt Campaign. “Princes of the Yen: Central Banks and the Transformation of the Economy” reveals how Japanese society was transformed to suit the agenda and desire of powerful interest groups, and how citizens were kept entirely in the dark about this.